A minor collision between cars ended up with a man clinging to the bonnet of a car as it travelled at speeds up to 70mph down a busy motorway. Richard Kamrowski held on by his fingertips as the enraged driver behind the wheel drove relentlessly for miles in Massachusetts, US. 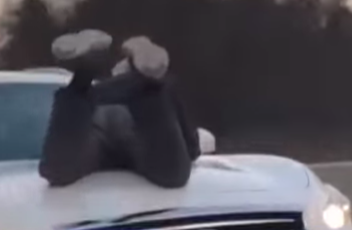 Shocking footage taken by other people on the road shows the car weaving along the busy motorway with a man in his sixties sprawled on its bonnet. The horrific scene began when Richard Kamrowski, 65, had an altercation with the driver of the white car, Mark Fitzgerald, 37, following a minor collision between their two vehicles. According to the police report, Richard got out of his car in an attempt to exchange paperwork with Mark and stop him from driving away, leaving the scene as a hit-and-run. However, rather than stopping and resolving the situation then and there, the driver of the white car allegedly drove towards Richard, forcing him to jump onto the bonnet of the 4×4 to avoid being run over. But apparently not even the fact he had a human being on the front of his car was enough to get Mark to stop. The enraged driver continued on to the Massachusetts Pike highway, driving for around three miles down the road which was packed with rush hour traffic. 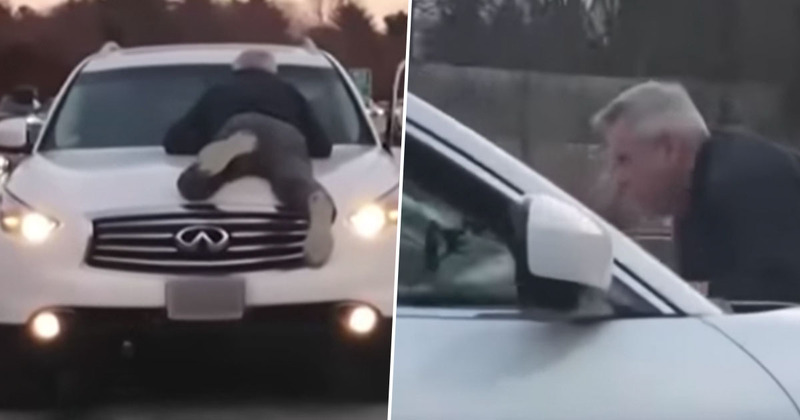 Videos show the white car moving erratically down the road, speeding along and braking suddenly as though trying to throw the unwelcome passenger from the hood of the car. In one part of the footage, in an impressive display of multitasking at its finest, Richard could be seen on his mobile phone while still successfully clinging on to his ride. Incredibly he managed to call the police from the bonnet without losing his grip. 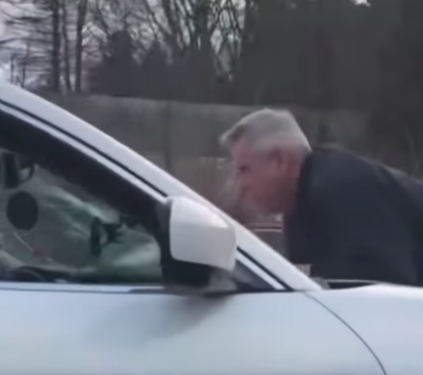 Thankfully Richard’s terrifying ordeal came to an end when concerned drivers managed to box in the white car, forcing Mark to a stop while still on the motorway. To ensure the driver didn’t think about trying to make another run for it before police arrived, one member of the public even brandished a gun and pointed it at Mark. Once authorities got to the scene, they arrested both men; Richard for disorderly conduct and Mark for assault with a dangerous weapon, negligent operation and leaving the scene of a car crash. He kept going fast, slow, fast, slow, trying to get me to slide off. I wasn’t getting off the car. Kind of like survival mode. Mark is also seen in the video, claiming Richard took a water bottle out of his car and smashed the windscreen of the white 4×4. The police report explains Richard smashed the window as he held on to the bonnet; presumably he did so in a further attempt to get the driver to pull over. According to CBS Boston, the dangerous driver has since had his license revoked.